» Articles » Sharp Tips » What Kind Of Soil Should I Use In Containers? What Kind Of Soil Should I Use In Containers? We will assume that “containers” come in a wide variety of sizes and shapes, but that the thing they all have in common is that some sort of living plant or plants will be grown in them. And we can think of plants as being annuals, bulbs, trees, seeds, or other living flora. What type of soil should we use then, in order for the plants to carry out their all-important duties of setting roots, sending out leaves, and making food for their own survival? Here’s the answer--think organic. That’s right, the best soil we can use to fill our containers will have a good mix of organic matter in it, from peat to composted plant material to composted cow manure to decayed natural wood products. Also, sand, perlite, or other impervious particles may be mixed into the soil to prevent compaction and to allow for water and air penetration into the soil. Here’s the best part--you don’t have to create your own mix. The leading suppliers of gardening products with names like Scott’s ®, Vigoro ®, Miracle-Gro ®, Peters ®, and others have bags of properly mixed and ready to use soils in your local garden centers. Some of the soils are even designated for the particular types of plants you might be setting into your containers (like African violet mix or cactus mix or orchid mix). And some of the mixes come with timed-release fertilizers (like Osmocote®) already added, too. 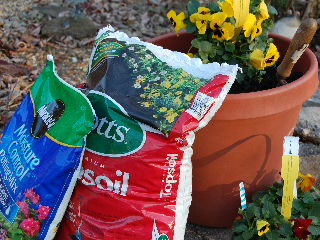 If you just want a good fertile all-purpose soil for your containers appropriate for planting annuals, get a bag labeled “potting soil”, that is produced by one of these major manufacturers like those we’ve mentioned. Here’s a word of caution--whatever you do, DON’T use soil from your yard or from the nearby woods (no matter how rich and fertile it may look) to fill your containers! These soils are subject to contamination from any of a number of bacteria that may cause the damping off and dying of your plants. The little bit of money and time you might save from using soil from your yard and not buying commercial potting soil will be lost in the money and frustration of having to replace your dying plants (and then purchasing potting soil, anyway!). 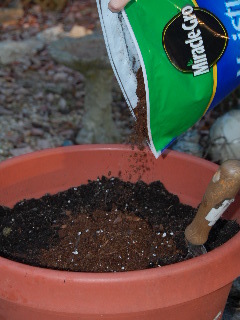 Here’s a cost-cutting tip that will work--if you have a lot of large containers to fill, you might want to consider mixing bags of commercial topsoil in with the potting soil (almost like an “extender”). You can save a little bit of money this way, since the bags of topsoil will be less costly than the potting soil. Just make sure all the products you use are supplied by brand name manufacturers.